A Handbook of Dates is an unrivalled reference book for historians. It provides in clear, user-friendly form, tables which allow the calculation of the dates (and days) on which historical events have fallen or will fall, from AD 500 to 2100. It describes the calendars and other systems used for dating purposes in England from Roman times to the present, including regnal years. Lists of Easter dates, saints' days, popes, rulers of England and the Roman calendar are also given. In this updated and expanded edition, edited by Professor Michael Jones, the introductory materials for each set of tables has been revised. New tables for legal chronology, old and new style dates, Celtic Easter, adoption of Gregorian style, and the French Revolutionary calendar have been added, while the existing Anglo-Saxon regnal lists have been significantly revised. 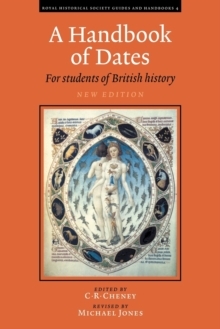 A Handbook of Dates is an essential tool for all researchers in British history.